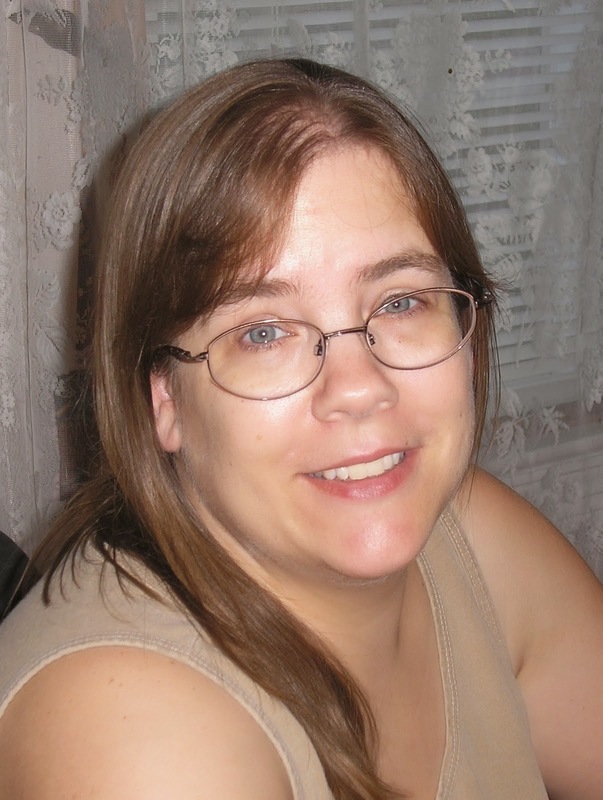 This post is a tutorial on using Marti Michell's Wonder Triangle ruler to make the Triangle-In-A-Square units in Bonnie. K. Hunter's Celtic Solstice Mystery Quilt. 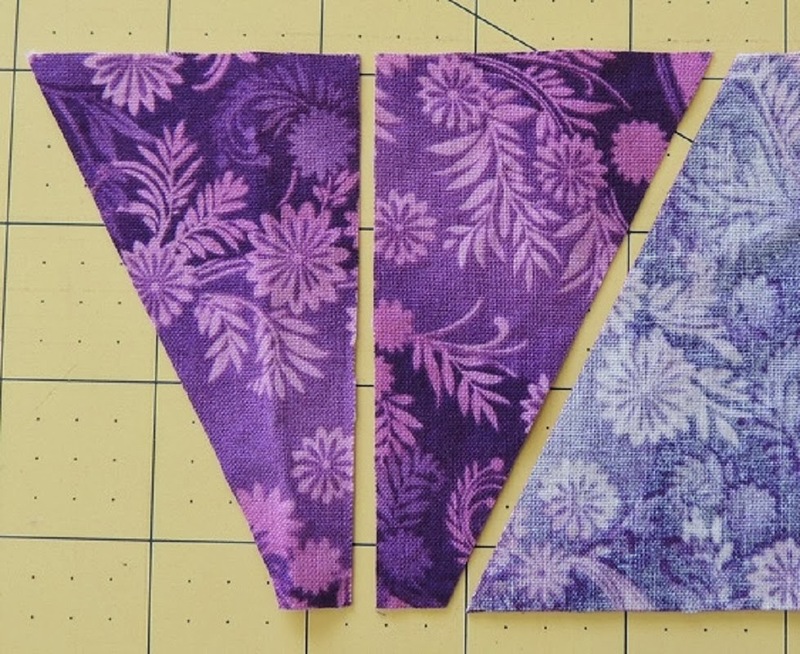 If you're not making Celtic Solstice, then you'll still get some useful tips on using the Wonder Triangles ruler, so please read on! Bonnie designed the Celtic Solstice mystery quilt using the Tri-Recs ruler, and she wrote her instructions assuming that ruler would be the one that people used. Those instructions still work just fine if you're instead using the Wonder Triangle ruler (W.T. from now on in this post). However, there are a couple of differences between the two rulers that you should be aware of for things to work out right. The first little kink comes with Bonnie's cutting instructions. The rulers (Tri-Recs and W.T. 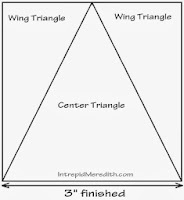 both) come as a paired set: one ruler is for cutting the larger, center triangle (the 'triangle' part of the Triangle-In-A-Square), and the second, thinner ruler is for cutting the smaller triangle 'wings' on each side of the center triangle. Once these are all sewn together, you've made a Triangle-In-A-Square (TIAS) unit. Cute, right? 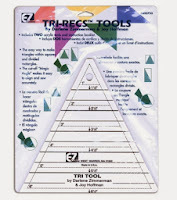 With the Tri-Recs ruler, you can cut the fabric strips for both the center and wing triangles 1/2" wider than the finished size of the unit. Since the unit we're making in Celtic Solstice will finish at 3", Bonnie tells us cut all of the strips for this clue at 3-1/2". In the W.R. instructions, however, we are told to cut strips for the center triangle 1/2" wider than the finished size, but strips for the wing triangles should be 5/8" wider than the finished size. It wants the wing triangle strips cut wider than the center triangle strips! DON'T WORRY!! You CAN actually use the same width strip for each of the triangles if you are using the W.T. ruler! So cut all the strips you'll need for clue #1 at 3-1/2" (per Bonnie's instructions), and I'll show you how it works out. Take a deep breath. Everything is O.K.! Cut on both sides of the ruler. Center Step 2: Rotate the ruler 180°. Line up the tip and the 3" mark on the ruler with the bottom and top edges of your strip. Be sure that the left edge of the ruler is flush with the cut edge of your strip! Cut on the right side of the ruler. The second piece is cut! Continue cutting your way down the strip in this manner: rotate, line up, cut. Center Step 3: Trim the bottom corners. You can accurately trim up to four layers of fabric for this step. I also like using one of the smaller-sized rotary cutters (28mm) on this part. Lay your ruler on top of one stack of triangles so the bottom right corner of the ruler lines up with the bottom right corner of your triangle. See that bit of fabric that sticks out from the blunted corner of the ruler? Use your rotary cutter to trim that little bit off. Do the same thing on the bottom, left corner of the triangle using the bottom left, blunted corner of the ruler. NOTE: The TriRecs ruler does not include this last step of trimming the bottom corners, but I think it's a good one. This is the excess fabric (dog ears) that would otherwise stick out after you finish sewing this unit. By trimming these bits now, you won't have to trim off the dog ears later! When you're done, your center triangles will look like the one on the left, with three blunted corners. 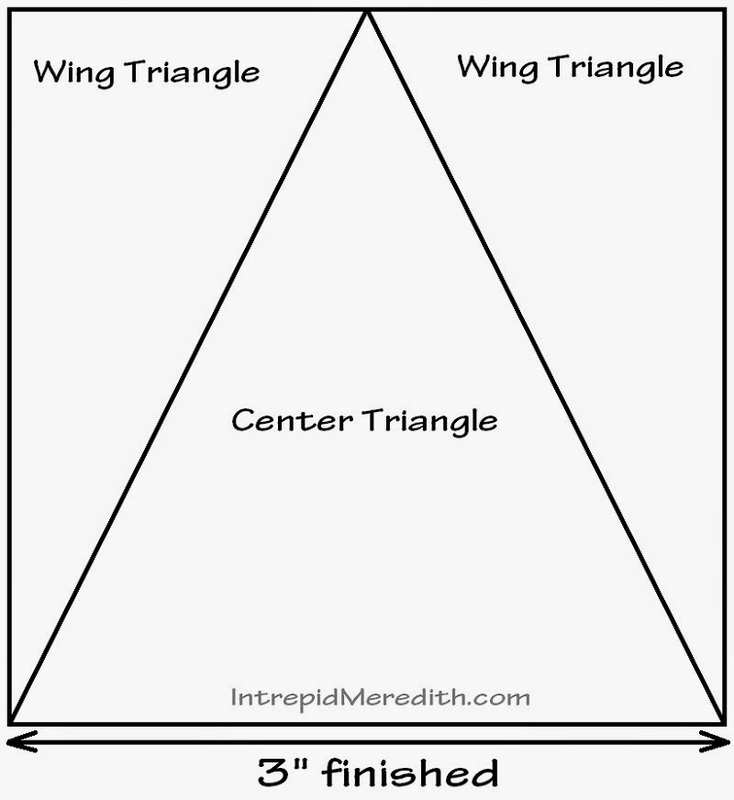 For each finished TIAS unit, we'll need one center triangle and two wing triangles. Take a look at the drawing of the finished TIAS unit near the top of this post. See how the two wings are mirror images of each other? One wing points to the right, and the other one points to the left. We can cut both the left-facing and the right-facing units at the same time by stacking our fabric strips in pairs with the right sides facing together (wrong sides together works too). If you forget this step and stack all your strips face up or all face down, then you'll only get ONE type of triangle. To get BOTH triangles from the same cut you MUST stack your fabrics in pairs with the right (or wrong) sides together!!! Wings Step 1: As for cutting the center triangles, you can stack up to four layers of fabric to cut the wing triangles. In this case, that would be up to two pairs of right- (or wrong-) sides-together strips. Line up the 3" line on the ruler with the bottom of the strip (again, the markings on the W.T. rulers are for the FINISHED unit size, not the cut size! ), and be sure that the left edge of the ruler is flush with the cut edge of your strip. Notice that the tip of the ruler sticks out 1/8" past the bottom of the strip. This is because we've cut our strips at 3-1/2" (per Bonnie's instructions), not the 3-5/8" that the instructions on the W.T. ruler asked for. DON'T WORRY! This extra bit of fabric is another one of those dog ears that would end up getting cut off later anyway. We'll still be able to line up our triangles without it just fine, and there's still plenty of fabric past our sewing line for a good seam. Make your cut along the right side of the ruler, and you've cut your first set of wings! If you open up one cut pair, you'll see that you've got both a left-pointing and a right-pointing wing, one for each side of a center triangle that you cut earlier! Take a peek if you need to, but otherwise, keep those pairs together for now. It will make Wings Step 3 a lot easier if these fabric pairs are not separated before we finish all of our cutting! Wings Step 2: Rotate the ruler 180°. Line up the 3" mark on the ruler with the bottom edge of your strip. Be sure that the left edge of the ruler is flush with the cut edge of your strip. Yep ─ that ruler tip just keeps sticking out there, doesn't it? The next set is cut! See? It's still easy peasy! Wings Step 3: Once you've cut your wing triangles, it will be time to trim off those extra bits again. You can accurately trim through up to four layers (two pairs) of fabric for this step. The smaller-sized rotary cutter works well for this step. In the photo to the left, see the bit of fabric sticking out on the left side of the squared-off tip of the ruler? Trim off that bit. NOTE: The TriRecs ruler has you trim this same bit, but not the next three that I'm going to tell you about. Again, trimming these extra corners will help you line up your triangles more accurately before sewing, and will also eliminate the need to trim the dog ears later. Next, there's probably just a tiny smidgen of fabric sticking out on the right side of the ruler tip. Trim off that bit also. Slide the ruler downwards until the 90º corner of the ruler matches the 90º corner of your fabric patch. Make sure those edges are lined up, and then trim off the corner of the fabric that's sticking out from the blunted edge of the ruler. Next, slide the ruler to the right, and trim the third corner of your triangle. And that's it! You have pairs of trimmed triangles for your TIAS units. Everything lined up? Good! Now let's get sewing. See the red line that I've drawn on my fabric pieces? That's the sewing line. We need to sew a scant 1/4" seam that starts at the top of the center triangle and sews down to the bottom right corner. I don't know why, but the whole unit seems to sew better when the first piece is sewn from top to bottom. Tip: If your smaller triangle (the fabric on top) keeps stretching past the bottom of the center triangle by the time you get down to the bottom corner, then try decreasing the pressure on your presser foot a bit. Very gently press the seam open ─ remember, we're working with two bias edges here, and we don't want to stretch them out of shape! Very often I'll start pressing the seam open with my fingers, but then I'll roll over it with a wide pizza dough roller. That seams to do a good job making everything nice and flat, but puts less of stress on the seam. Note the direction of that red sewing line ─ see how it's flipped directions? Where we sewed the first two pieces together from top to bottom, the second wing will be sewn starting at the bottom and stitching up to the top. Once you've gently pressed the unit open, it will look like the picture on the left. Isn't that pretty? And look ─ no dog ears to trim! The unfinished unit should measure 3-1/2" x 3-1/2"
There should be 1/4" between the tip of the center triangle and the top edge of the unit. This is your seam allowance. If you measure 1/4" up from the bottom and 1/4" in from the left and right edges, those two points should be right on top of the edge of the seams between the center triangle and each of the side triangles. Again, that's more seam allowance. Well, that's it. 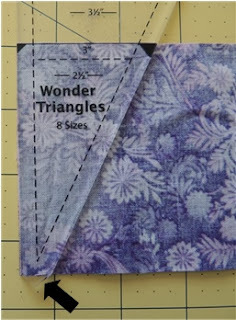 I hope that you've found this tutorial on the Wonder Triangle ruler informative, and that you'll be able to whip out your Triangle-In-A-Square units with ease in whatever quilts you make in the future. Thank you for this great tutorial! I am using a combination of rulers, had to reset the last wing on a few, but they are now going well! The tute will help remind me how to line up the wings for the correct unit size. Excellent! 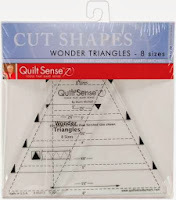 I stood in the store debating between the Wonder Triangles rulers and the Tri-Rec ruler for the longest time. I finally bought the Wonder Triangles set but was confused... this is a great tutorial! Thank you!